When I was younger, it was my mission to build card sets: both complete ones and team sets. It made me feel like I accomplished something, and it felt good to put the final card into the box and put it in the closet with the rest. To this day, I keep two copies of each player card I like, one for the set and one for my binder. Now that I’m older my interests have changed a bit: I still collect small sets, but my main collecting focus is on a few players. One player in particular defines my collecting habits. Think you know who it is? I can see your train of thought now. “Well, she’s a season ticket holder for the Yankees and a woman, so she must collect Derek Jeter, right?” Nope. “Well then it has to be A-Rod?” Wrong again. Don’t get me wrong. I love Derek Jeter, and not because he’s “cute”, but because he’s a leader and he runs hard to first whether the team is down or up 10 runs in the 9th. As far as A-Rod goes, his stats speak for themselves despite the controversy, and he will end up being one the best players of all time when all is said and done. 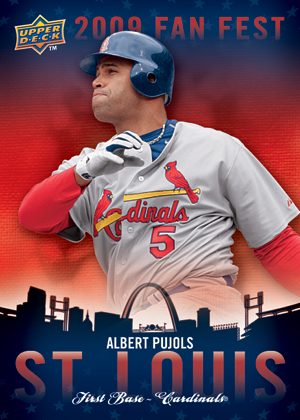 But despite my Yankee devotion, my heart lies in St. Louis with the Prince himself, Albert Pujols. Shocked? Most people are, so I’m used to it by now. 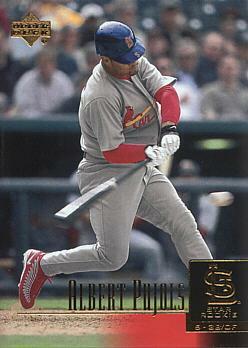 For anyone living under a collecting rock, Pujols rookie cards hit shelves in 2001; coincidentally and unfortunately, a time when I was in college doing other things and not buying baseball cards as much as I used to. From around 1999-2002 I bought some here and there, but not nearly as much as I bought after those years or even before. I really couldn’t have picked a worse time to take a break considering how expensive Pujols rookie cards are now, but what did I know? Once I got back into the hobby I decided that if I was able to complete a set then great, but my goal was to start collecting Pujols. The reason I picked him? Simple: I read the back of his cards, saw his stats, watched him play and knew that throughout his career, he’d be the best player on the field at any given time. Over the years I have managed to put together a decent collection of Pujols cards: roughly 800 unique cards (including one triple relic autograph that I got for my birthday), a couple of rookie cards, and a 1/1 sketch card. I pulled the 1/1 Pujols out of a case, probably the best pull I’ve ever had. One of my rookie cards is the 2001 Upper Deck card, and it was actually sent to me months ago by a fellow card blogger who knew I collected Pujols. He sent it along with some cards that I knew were coming, though the contents were a surprise until they arrived at my door. Talk about a smile from ear to ear, I was ecstatic for days that someone would be that generous to little old me. The generosity of the hobby’s blogosphere truly is astounding. I could tell stories all day, but we’ll save that for another time. Anyone who collects a player, or several players, knows how difficult it can be to track down all the different parallels (especially if you’re collecting someone like Albert Pujols or Derek Jeter). You can break pack after pack, boxes, and even cases, yet only end up with one single card of those guys. I say this from experience. For example, my friend Suzy and I broke a case of 2008 Upper Deck Masterpieces which yielded two Albert Pujols cards and two Derek Jeter cards. That gave me new meaning to the term “short print”, and more over a better understanding of why I end up paying more money for the base cards in some sets. To collect a player takes a lot of motivation, dedication, and discipline. Did I just say “discipline”? I sure did, and I will tell you why. For many products it usually makes more sense to buy single cards of your player from the local hobby store, card shows, or the internet, rather than chasing down eight different color variants thinking you will actually get them on your own. Do I follow my advice? Absolutely not! It would take all the fun out of collecting. There’s nothing more alluring than those shiny wrappers just asking to go home with you in the store, so don’t feel bad: adopt a pack and take it home. While I do purchase single cards online and at card shows, I find it more fun and more gratifying to open up a pack or a box and find the Pujols card I needed all on my own. For example, I was roughly on my 40th (not kidding) blaster of 2009 O-Pee-Chee Baseball, and last night in the fourth-to-last pack, there he was . . . an Albert Pujols #100 black parallel just for me. Coincidentally, I got another card I really wanted in the same blaster: the Face of the Franchise Derek Jeter insert. Two hard to find inserts that made me super happy; buying boxes of cards doesn’t get much better than this. Are you a player collector eager to share who you collect and how you do it? I would love to hear about it. Come back later to see some pictures from the Yankees vs. Red Sox series. I was given tickets on the field level for Saturday’s game, in the “moat” (aka the $1300 seats behind the dugouts) for Sunday. While I can’t say the surrounding crowd in the expensive seats was as much fun as the bleachers, it will probably be the only chance I get to sit in these seats . . . so I took advantage. 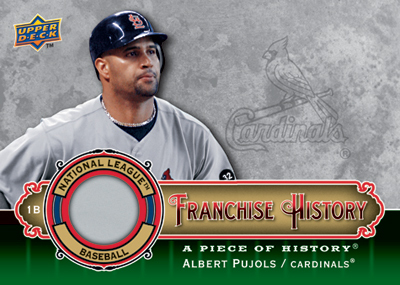 Nice write of your Pujols ensemble; 600+ cards must be something else! I’ve worked to complete a Jamie Quirk collection for the past several years. He played for 18 seasons from the 70s to 90s, yet rarely merited parallel cards or extra issues. There’s 67 in the binder now and it should be feasible to get them all, ~75 total. Most cards came from trading partners, though some autographs and other harder-to-find issues forced me to use eBay. It still surprises me when one turns up in a graded slab, as if Quirk cards in nice shape will be scarce one day. Great article! Been going through my collection and figuring out who to focus on going forward, curious on what made you decide to pick Pujols (other than being a great player). I collect Frank Thomas. Why, because when I started playing baseball, I played first base, and the Big Hurt was the best first baseman at the time. I have about 2500 Thomas cards with no idea how many are unique. I would guess about 1000 or so. My next project is to log all my Thomas cards so I know for certain. KingSwede, I decided to collect him just based on his early stats, and I liked watching him. He has a great swing, and he fields his position well. Kory, that’s awesome! If you ever want to trade some Thomas for Pujols, let me know I have him separated in a box by player. Some of the bigger, or better players in my personal collection are sorted by player as opposed to leaving them in their individual set boxes. Last but not least, thanks Twitchy.